As I’m often on a quest to have a healthier diet in order to lose weight and just be more healthy and happy in myself, I was pleased when I was sent some of JF Rabbit’s Veg Water to try out. I took part in a health workshop at work this week and they were very keen to emphasise that in order to be healthy, you need to keep hydrated. I do find it quite difficult to drink the required amount of water every day (I prefer my water spiked with coffee!) as even though I do keep a glass on my desk to drink throughout the day, when I’m running in and out of meetings and driving all over the country it’s very easy to forget to take a sip. One of the problems with drinking water is that it is pretty tasteless. I sometimes add squash to it which makes it not as healthy and, although I’ve been keen to try the cucumber water recipes that I posted on my blog a while ago, I just don’t get round to it often enough. That’s why JF Rabbit’s Veg Water is such a good idea. 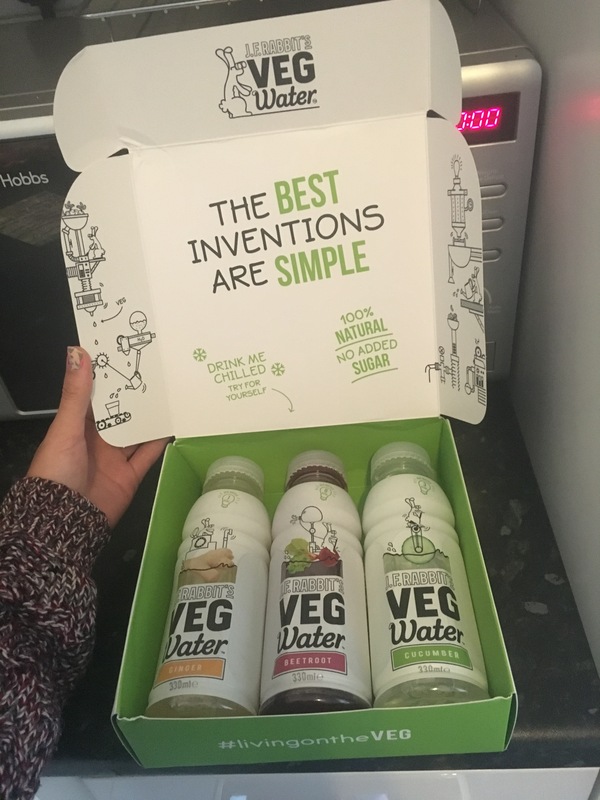 These healthy drinks are created using nothing but veg – that’s right, no added sugar and no nasties – which means that they’re full of good stuff and only contain a few calories (under 10) in each bottle. The bottles are also recyclable and its made in the UK with ingredients sourced from the UK wherever possible which is great for those of you who are environmentally or economically conscious. I got sent three flavours – Crisp Cucumber Water, Zinging Ginger Water and Earthy Beetroot Water and I’ve been taking them to work with me this past week. Ok, so the taste is nowhere near as delicious as a Diet Coke, cloudy lemonade (pleeeeeeease – only a select few will understand this very niche reference, if you do let me know in the comments! ), or a Ribena, and I would take any one of them over this if they were healthy. But they don’t taste totally disgusting and they are a lot less boring than plain water. My favourite flavour was the Crisp Cucumber which is sharp and refreshing. I love the ethos of the company which is all about keeping things simple. Nothing but water, fresh veg juice and natural veg flavour. Now I just can’t wait to try the skinny prosecco! Find out more about JF Rabbit’s Veg Water here. Just tried the Crisp Cucumber water and unfortunately it does not taste of cucumber, it just has a harsh water taste. It’s really easy to make great tasting cucumber water with cucumber slices and some water, put one in the other and leave them to infuse for 30 minutes or so. Don’t waste your money buy a cucumber and DIY! Sorry to hear you didn’t like the Crisp Cucumber water John! Some great tips for DIYing though!